WORDLESS WEDNESDAY - "The Girls"
Here is one of the very few photos I have of my mother-in-law, in late summer 1970, taken while on the sidewalk outside our home in Kitsilano, Vancouver BC. I'm holding my second daughter Megan, Reba is holding my first daughter, Pia. Reba died in August 1974 of liver cancer, likely due to a much earlier hepatitis infection [the most common cause of liver cancer]. Following the challenge of writing 52 Ancestors in 52 Weeks, issued by Amy Johnson Crow, here is my 13th installment, for John KUHN, my 5th great-grandfather on my maternal line. Various researchers have not been certain when the original immigrant John KUHN arrived in British America, with his family. However, it seems to have been by 1732 or 1733, when he is noted living in the Goshenhoppen area, in what is now Berks County, Pennsylvania. Most of the following information has been found in a variety of places including the following: (a) "Eckroth-Eckenroth-Eckenrode Family" Vol. 1 & 2, William Kirkpatrick; published 1987 by Chris Pelikan; (b) FindAGrave Memorial information at Conewago Chapel Basilica Cemetery; (c) Goshenhoppen Church Registers: Births, Marriages, Deaths [I have pdf copies of these]; (d) Early Catholic Migration website; all online. John KUHN died on 14 Feb 1751, his wife, Anna Barbara died several years later. They are buried - as are many others of my KUHN ancestors - in the Cemetery of the Conewago Chapel Basilica. KUHN, John, on 14 Feb 1751, carpenter, with whom Rev. Theodore Schneider, the founder of the Goshenhoppen missions, was wont to lodge. Note that Father Schneider was the first priest arriving in Philadelphia in about 1741, sent to minister to the German parishioners. John Kuhn and his sons and neighbours built a church which stands in Bally, Berks County, PA, as shown in the link in the second paragraph above. Various early tax registers show the Kuhn surname spelled a variety of ways: Coontz, for example, as well as Koon, Koone, Kuhnz, and other variants. There have been a few tantalizing clues about precisely where in Wurttemberg the family originally lived, before they emigrated en masse. On several records they are listed as from Wurttemberg, specifically from Schlaitdorf, and there is a very possible birth record in Neckartailfingen, Wurttemberg. Both Schlaitdorf and Neckartailfingen towns are next to each other. A tiny clue, but challenging to research. If you have information or questions about John KUHN and his family, do leave a comment or contact me via calewis at telus dot net; I would love to hear from you. Following the challenge of writing 52 Ancestors in 52 Weeks, issued by Amy Johnson Crow, here is my 12th installment, for James FERNALD, my 6th great-grandfather, on my maternal line. James is the son of the Immigrant settler in the Kittery area, John FERNALD. James' father, John, is listed as one of the early settlers after 1632, on the Kittery Maine town website, under Historical Notes (halfway down the page). I have more research to do in this Fernald line, and see that no mention of John's wife, James' mother, is made on records. Several family trees give the name of Mary Norman, but no document/supports for that statement. James was born in 1675 in Kittery, now York county, Maine, and married Mary HINCKS (possibly this surname is as a widow) in about 1700-1705. No marriage record is yet found. I suspect that there are other siblings of James, but as yet I have not found clear proof of relationship. In 1728/9 James' name is listed with a number of others in deeding land designated for a second church, on land between Kittery and Eliot, on "Gower's Hill", belonging to the Fernalds. The link goes to a very attractive 1730 church - scroll down to the lower section where the second church is listed as a Congregational church, first served by Rev. John Eveleth (another important name in my family tree) from 1729-1734. A timeline about Kittery and Eliot may be found here. James will has been transcribed by others, from Maine Wills, 1640-1760 (pub 1887) p.444. The value of his land and and goods was set at over 4160 pounds. He states in his will a number of times that he is bequeathing "...besides what She has already had out of my Estate." This seems to indicate that he had already given goods or lands to his daughters and one son before his decline. Two of the three Witnesses on the Will are unknown-to-me Fernalds: Lydia Fernald and Benjamin Fernald. More clues are here for researching the early Fernald history in Kittery and Eliot. As early settlers in the Kittery area in Massachusetts, the Fernald family is likely written up in journals and books/histories of the region. It is clear a trip to our BC Genealogical Society library is needed so I can search in the NEHGS databases online there! If you have questions or comments, please leave them below, or contact me via calewis at telus dot net. Following the challenge of writing 52 Ancestors in 52 Weeks, issued by Amy Johnson Crow, here is my 11th installment, for Elizabeth ABREY, wife of the immigrant settler, my 6th great-grandmother on my maternal lines. I have so little information on Elizabeth, that I'm embarrassed. Which is why I'm writing about her - this tiny bit. I have only her first name; her surname is unsubstantiated by any quality documentation. As far as is known, the MORGAN family immigrated about 1718, settling in Pennsylvania. Most information on Thomas is based on descriptions of his youngest son, Col. Jacob MORGAN and his exploits. Elizabeth? She is not mentioned - except for her first name, listing her as his wife [living] at the time of Thomas' will, 6 Dec 1740, probated in Philadelphia, 25 Mar 1741. The only information I have about her is from a number of family trees who have no documentation attached. Her birth date is estimated only - looking at the birth years of her 4 or 5 sons - to be likely 1668-1675, place unknown but likely in same area as her husband Thomas. Their marriage date is also unknown, but likely to be approximately 1695. Her death date is not listed anywhere that I have found as yet, but is likely to be from 1741-1750. The Morgan family settled in the Caernarvon area of PA with a large number of Welsh immigrants: Jenkins, Piersol, Morgan, Davis, Evans, Bowen, Hudson, Williams, Allen, Martin, and others. I have an early .pdf map of the area with drawing of land plots, Warrants from early 1700s onwards. Contact me if you wish a copy of this map. If you have any information or questions about Elizabeth ABREY, wife of Thomas MORGAN, the immigrant settler, do contact me via calewis at telus dot net, and/or comment below. English Bay near the Sylvia Hotel in Vancouver BC Canada. I'm in the middle here, aged 18 yrs, just finished high school. On the left is Marie, one of my Kalifornia Kuhn cousins, about 15 yrs. And on the right is Wendy, about 16 yrs. Both these two cousins died of cancer. As did Marie's father (the elder of my mother's 2 older brothers). And cancer affected Wendy's mother as well (the eldest of my mother's 2 older sisters). 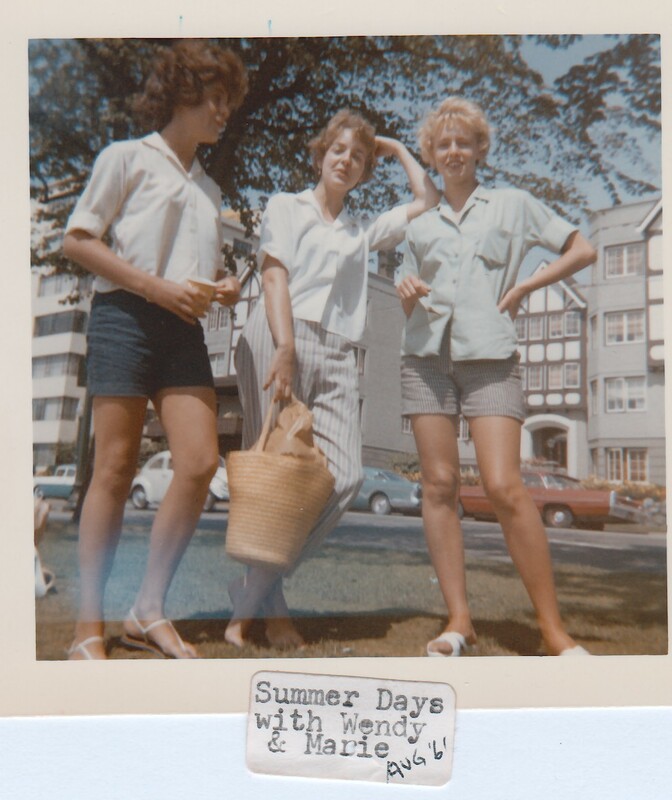 But in this slightly fuzzy photo, we're 3 teenagers having fun in the sun, August 1961, enjoying the day at the beach. Following the challenge of writing 52 Ancestors in 52 Weeks, issued by Amy Johnson Crow, here is my 10th installment, for Robert BOLTWOOD, the immigrant settler, my 9th great-grandfather on my maternal lines. Robert BOLTWOOD, b. abt 1620, possibly in Essex, England, where the name was apparently known from the 1200s. He is listed in several early New England history books as having immigrated first to Connecticut area in about 1643 when he would have been in his early 20s; he is first recorded there, and was a Sergeant. He quickly moved to Massachusetts, and was an early settler in likely Wethersfield MA. By 1646 he had married Mary GERNOR (or Gernow), who was an early Massachusetts-born child in about 1626 in Northfield. The new Boltwood family apparently moved to Hadley where all - or some of the first-born children were born: one son, and 4 daughters. Robert had some land in Glastenbury (the eastern part of Wethersfield) - "a grant of a pond and quantity of land adjacent from an Indian chief Peckhaun." [p.409, History of the Town of Northfield, Massachusetts, by J. H. Temple and George Sheldon, published by Joel Munsell, 82 State St., Albany, N.Y., 1875]. He was a first settler of Hadley, Massachusetts, and was made a Freeman on 26 March 1661. He is listed as having land grants, by 1663, in Hadley. Quite a bit is written about Robert & Mary's only son, Samuel, and some of their children. However, I don't yet have the children of the younger 3 girls who married the 3 Warner men - who are likely brothers. But I haven't researched to determine if it is true that the Warner men were brothers, nor how they might have been related, where they lived, nor who their parents were. Research is never done! I have a few more clues to research, and I'd love to know more about Robert, one more of our early immigrants from England. If you have any information or questions about Robert BOLTWOOD or his wife and children, I'd love to hear from you. You can contact me via calewis at telus dot net, and/or leave a comment below. And then, I'll get back to doing more research on Robert and his family.